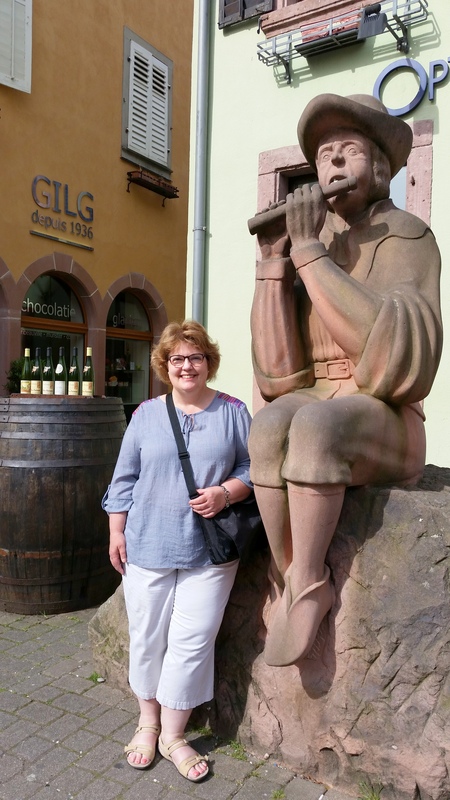 Love Letter to Alsace is a series of essays about my trip to the Alsace region of France in May 2015. It was of the most delightful adventures I’ve ever experienced! I hope you will enjoy reading about different aspects of the trip, from traveling to the destination, to stories about the lovely towns and villages we visited, and more. Okay, it’s corny. Ribeauvillé, actually? As in “Love, Actually?” My son just mentioned that his girlfriend loves that movie and so do I and I LOVE Ribeauville, so . . . . Anyway, Ribeauvillé is pronounced kind of like this: ree-bow-vee-lay. It’s a tough one because the French kind of gargle a hint of the “R” sound in the back of the throat and whenever we tried to say it that way, people would laugh at us. If we just started out with an ordinary American-sounding “R,” they would correct us, we’d try the gargle-R again, and they’d laugh more. I was standing in the middle of Ribeauville’s Grand Rue. See the castle on the hill above? Regardless, having taken French for four years in high school when my mind was young and perky and sponge-like, it’s amazing to me how much of the language (if not the correct pronunciation) came back to me during our nearly two-week stay in Alsace. Kind of like being able to sing all the lyrics to every Beatles song written prior to, oh, maybe 1967. As I told you last week, finding a flat to rent in Ribeauvillé on Airbnb was serendipity. I knew nothing about the town, other than its primo location between Strasbourg and Colmar. It turned out to be one of my favorite places, well, in the world. View from inside the castle ruins, looking down to the countryside around Ribeauville. 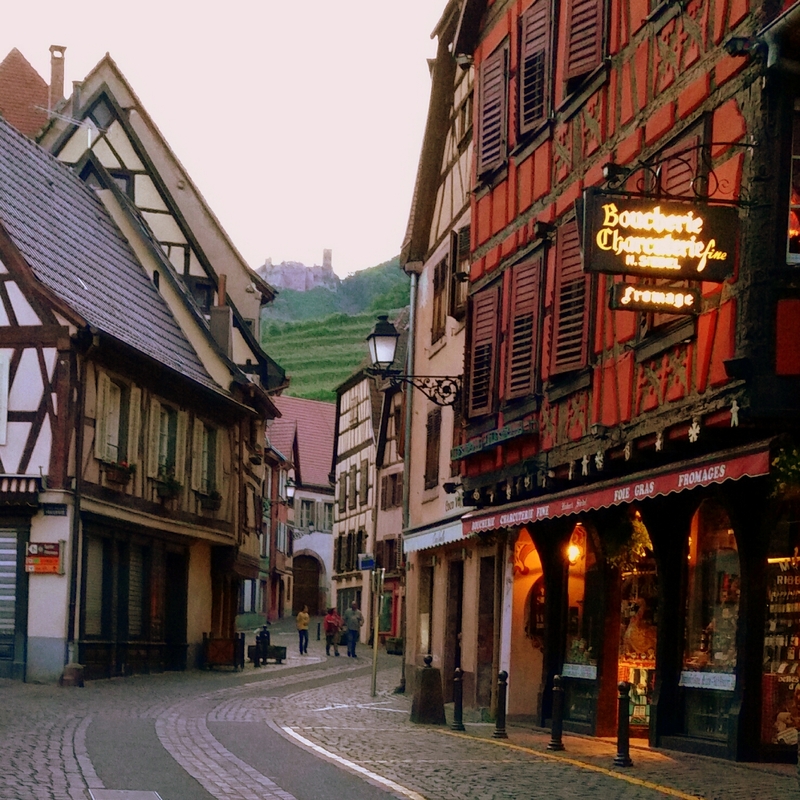 Ribeauvillé is located about midway on the 170 km Alsace Route des Vins, or wine route. The early Romans who first marched up and muscled in to conquer and rule the area eventually relaxed into the green, rolling countryside and planted vineyards to create their favorite beverage. Less military, more vino, and plenty of the guys decided to stay behind for the good life instead of returning to hot, dusty Roma. The most successful vineyards for that climate produced grapes perfect for making dry, white wines. Some vineyards facing the south or southeast, soaking up the sun and warmer breezes, have been producing wine since the Middle Ages. Sue enjoying the Muscat at Jean Sipp Winery. In beautiful Ribeauvillé, the commune proudly boasts three Grand Crus and offers fragrant Rieslings, Pinot-Gris, Gewurztraminer and my favorite, Muscat. Sue and I particularly enjoyed the Muscat at the Jean Sipp Winery in the upper part of the city. We enjoyed meeting the owners, cousins of our Airbnb landlady, Sophie Sipp, and their tasting room was a lively, friendly place. Ribeauvillé has one long, main street, the Grand Rue, where nearly all the restaurants and shops can be found. Smaller side streets tend to be more residential, but the Grand Rue hosts a parade of locals, tourists and day trippers all day long. There’s a healthy contingency of hikers and bicycling enthusiasts making their way to the hills rising above the village. 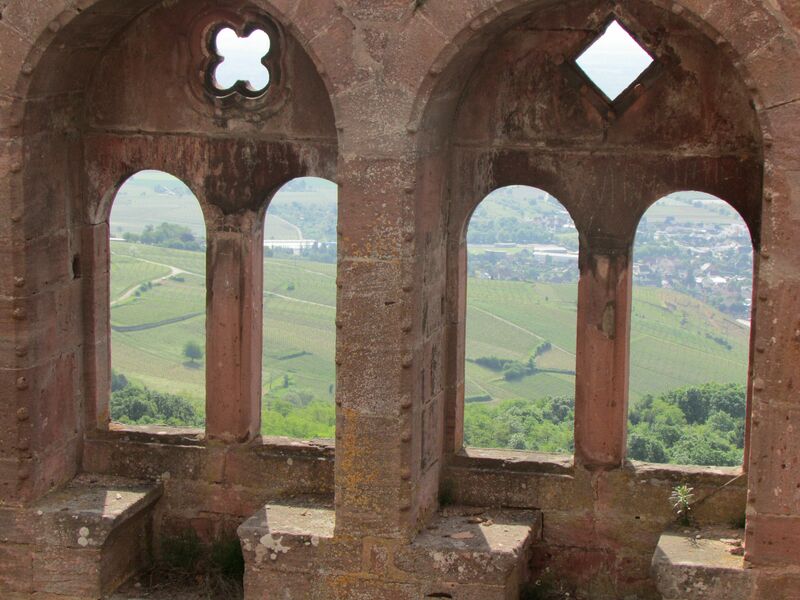 The ruins of three pink sandstone castles are the hikers’ destination, promising spectacular views of Ribeauvillé and the surrounding countryside. 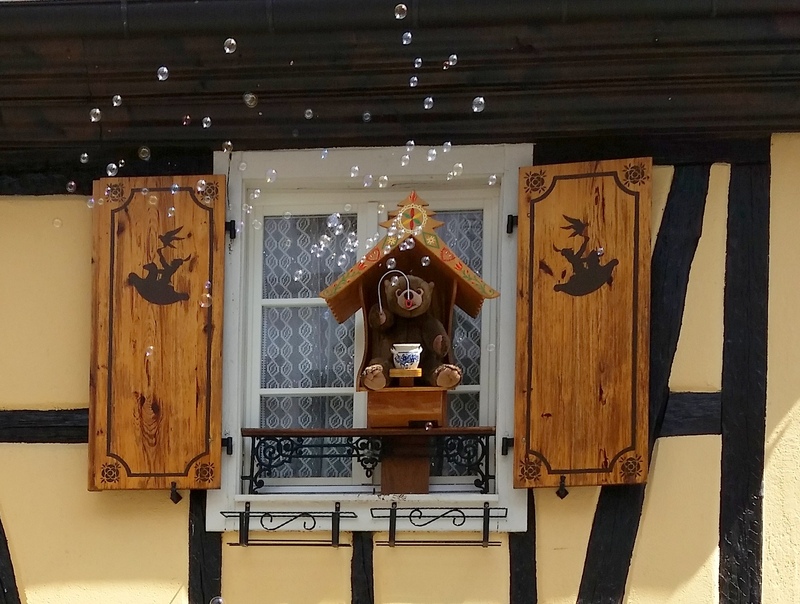 The little bear delights children passing by as he blows bubbles above the souvenir shop below. Bicyclists claim their patch of the road on the Route des Vins and also can ride right through the vineyards on bike trails created especially for them. Seeing them in the distance, their shiny helmets bobbing along above the vines in the sunshine, sure made cycling look like an appealing option to explore the area. I’m posing demurely with the minstrel statue in Ribeauville. Ancient Ribeauvillé was the seat of the Seigneurs de Ribeaupierre – the Lords of Ribeaupierre. Today in the town you can visit the Butcher’s Tower, built in the 13th century, the 18th century Hôtel de Ville, or town hall, the Maison des Menetriers, or house of the fiddlers, and what almost feels like a stage set of colorful half-timbered buildings housing bakeries, boutiques, restaurants and more. Thousands flood the town the first Sunday in September each year for Pfifferdaj, the Minstrels Festival (this link should take you to a YouTube video of Sophie’s float). 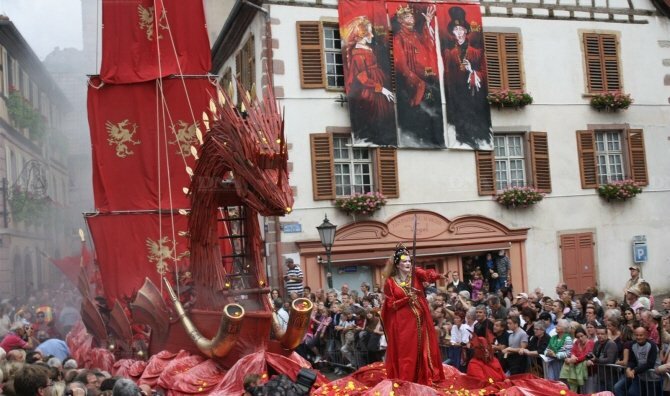 This is the oldest festival in the Alsace region, celebrating the lords of Ribeaupierre and the minstrels they protected. Fantastical floats parade down the Grand Rue, each creatively interpreting a theme inspired by images from Medieval history, such as peasant life, castle life, trades, animals, fortune, etc. Our friend Sophie shared photos of her group’s floats over the years where she has figured prominently (see below). That’s Sophie in the front of everything, long flowing hair and wielding a sword in the 2012 parade! I would love to return to Ribeauvillé one day – perhaps even to witness the amazing Pfifferdaj firsthand. But in truth, my favorite times during our stay there were early in the morning and again in the evening when the streets were quiet and I could almost imagine that this was my home. Hearts and plaid – traditional Alsace folk designs. 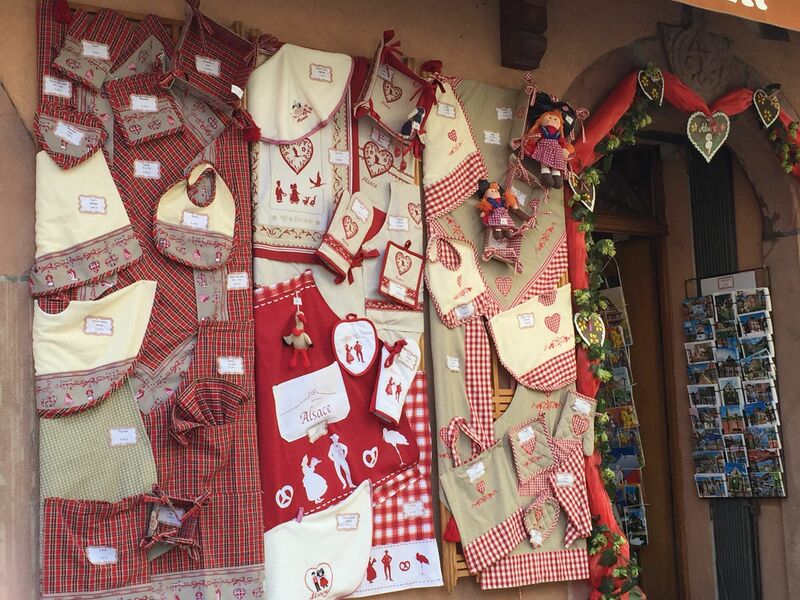 Hearts and red plaid fabrics feature prominently in the many souvenirs for sale in Alsace. I know I left a piece of my heart there, and it’s resting in the magical town of Ribeauvillé, with castles hovering on the hills above. 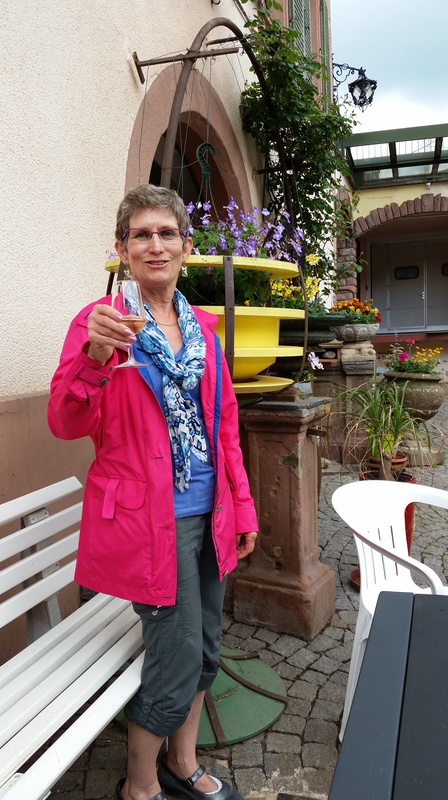 This entry was posted in Travel and tagged Alsace, castles, cycling, France, hiking, Jean Sipp, Middle Ages, Muscat, Pfifferdaj, Ribeauville, Romans, Route des Vins, vineyards, wine, wineries. Bookmark the permalink. Thanks so much, Deb! You would love it there. I’m planning at some point to make a little photo book focusing on windows, doors and signs in Alsace and always,ALWAYS, each lovely place is enhanced with exquisitely designed flower boxes and pots of mixed flowers and greenery. Their growing season was just a few weeks ahead of ours and I enjoyed seeing everyone’s new plantings for the summer ahead.